Here’s a custom tooled leather wallet with a eagle adorning this wonderful piece. It’s ultra thin, 100% vegetable tanned leather finished in a custom mix colors to achieve this fantastic cranberry color. It’s one of one with a secret compartment for bills and two more for cards. As well as 4 pockets and a bill slot. 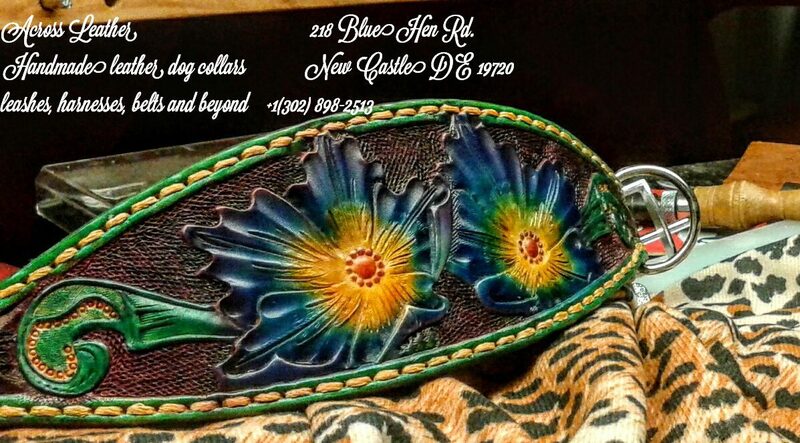 Here’s a large custom tooled leather dog collar with a red rose theme. Comprised of 13 oz. saddle skirting leather and 4-5 oz vegetable tanned leather liner which makes for one strong collar and or severe duty collar. 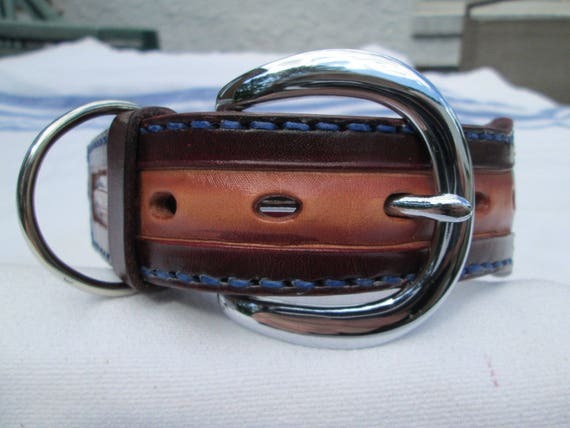 This large leather collar measures 2″ wide with stylish 1 1/2″ tapered ends. 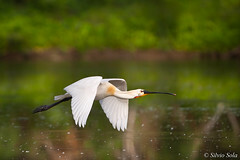 In length 20 1/2″ is best fit. There are five holes on 3/4″ centers starting at 19.0, 19.75, 20.5, 21.25 and 22.0″. The buckle is solid brass with a welded metal d ring and matching leather keeper. 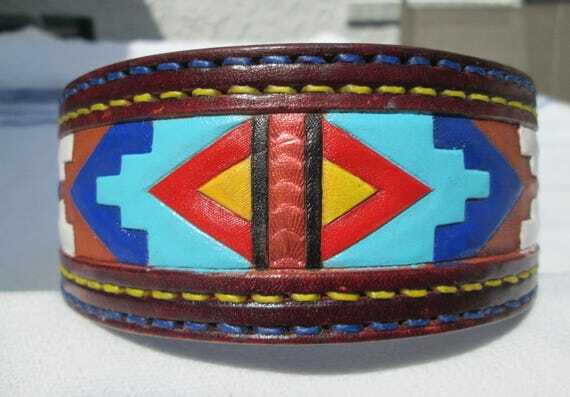 After gluing the two pieces of leather together it was custom hand tooled, oiled, edges beveled, airbrushed with spirit dyes and edges fully burnished to perfection. Hand rubbed and oiled again, then fully coated with a poly top coat finish to guarantee years of beauty and service. Thank you for stopping in this Holiday season wishing you and yours the very best! 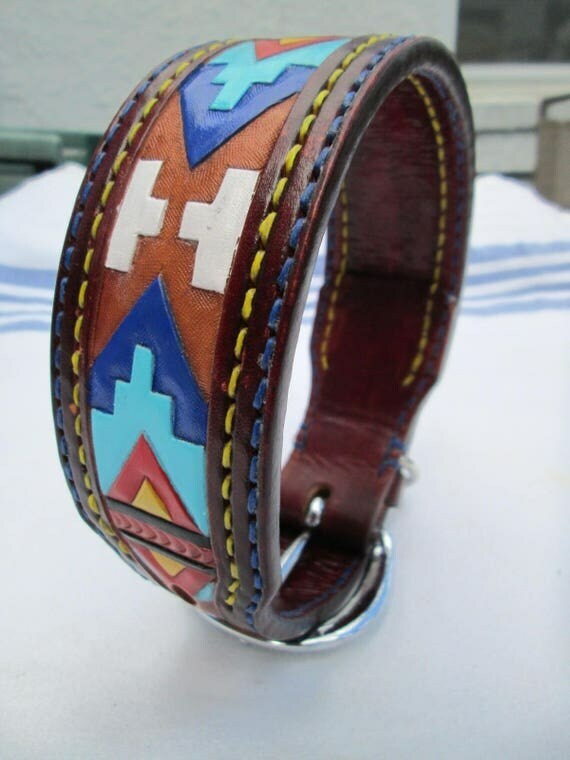 The excited Miss Daisy took delivery of her first “Across Leather” custom tooled leather dog collar. 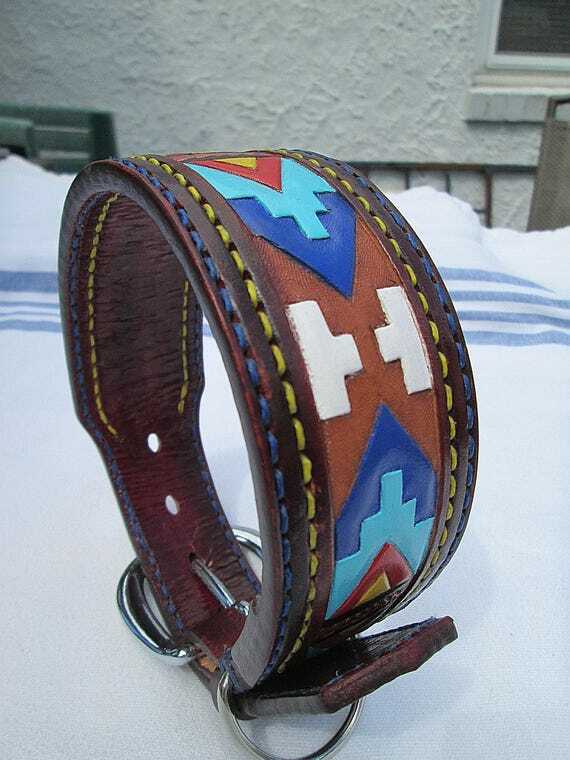 The oak leaves are arms to chairs when I was sub-contracting some tooled leather work from Northwest Native Designs owned by Ernie Apodaca.